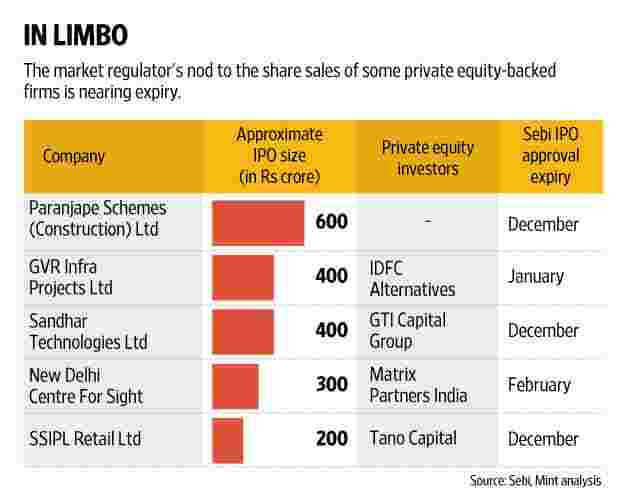 Mumbai: Several companies continue to struggle to launch their initial share sales despite a booming primary market. Most of these firms are backed by private equity (PE) firms and investors are looking to exit their investments through the initial public offerings (IPOs). IDFC Alternatives-backed infrastructure firm GVR Infra Projects Ltd, Matrix Partners India-backed New Delhi Centre For Sight Ltd; Tano Capital-backed footwear maker and retailer SSIPL Retail Ltd; GTI Capital Group-backed auto parts maker Sandhar Technologies Ltd and Pune-based real estate firm Paranjape Schemes (Construction) Ltd have failed to access the IPO market after obtaining clearances from regulator Securities and Exchange Board of India (Sebi) about nine months ago. Sebi’s approval for an IPO is valid for 12 months. Collectively, these firms planned share sales worth Rs1,800-1,900 crore to fund future growth or provide an exit to their PE investors. This contrasts with the decent run several PE firms have had this year in terms of partial or complete exits through IPOs of portfolio companies. There have been about 24 IPOs in 2016, which collectively raised Rs24,940.8 crore, according to data from primary market tracker Prime Database. Several among these IPOs, such as those of CX Partners-backed Thyrocare Technologies Ltd, ICICI Venture- and Gaja Capital-backed TeamLease Services Ltd and Sequoia Capital-backed Ujjivan Financial Services Ltd and PE consortium-backed RBL Bank Ltd were heavily oversubscribed. The IPOs of Thyrocare, TeamLease, Ujjivan, RBL and Endurance were subscribed 73, 66, 40, and 69 times, respectively. Several other companies have been left out of the party. In June, Mint reported that at least seven companies had shelved their IPO plans, since the start of the year. These included companies such as Warburg Pincus-backed ACB (India) Ltd; TPG and Actis-backed AGS Transact Technologies Ltd; Tano Capital-backed logistics firm Shree Shubham Logistics Ltd and Blackstone-backed Nuziveedu Seeds Ltd. In 2015, 21 companies managed to raise Rs13,614 crore from the primary market, data from Prime Database shows. The resurgence in the IPO market came after a lull of two years, which saw just eight companies raise close to Rs2,485 crore in 2013 and 2014. PE investors were banking on the buoyancy in the primary market to help them exit some of their mature investments. According to market experts, factors such as sector-specific issues, high valuation expectations of promoters and PE investors, and poorer-than-expected financial performance are among the reasons why companies are unable to launch IPOs despite the strong momentum in the primary markets. “A lot of the companies trying to bring out IPOs were funded by PE investors at the peak of the last cycle in 2007 and 2008. Given the high valuations at which these investments happened, the rupee depreciation of almost 50% since then and the current industry and market scenarios don’t augur well for PE investors making high returns and, thus, several PE funds would look to wait further to take their company public," said Arun Kejriwal, founder of Kejriwal Research and Investments Services Pvt. Ltd.
Additionally, several sectors such as real estate and infrastructure continue to struggle and are not the favoured sectors of public market investors, making IPOs of such companies difficult, he said. “However, that said, 2017 should be a bigger year for the IPO market. We will also see pricing of issuances becoming more affordable. This will be pushed by increased competition from government divestment offering, and this competing supply of paper will make companies offer better pricing," Kejriwal added. Some of the five companies cited above have already started looking at alternative routes to raise funds and provide exit to their investors. “We have received a lot of interest from PE investors as the best platform in scaling the eyecare industry that it gave us pause to think on the best path for value creation..," said Avnish Bajaj, founder and managing director at Matrix Partners India, in an email response. Matrix Partners is invested in New Delhi Centre For Sight. SSIPL Retail, in an email response, cited evolving strategic developments in the company as the reason behind it not moving ahead with the IPO plan for the time being. Sebi approval for SSIPL Retail IPO expires in December, while that for Centre For Sight expires on 1 February. Emails sent to Paranjape Schemes, GVR Infra and Sandhar Technologies did not elicit any response.